Anyway I had some last minute prep to do for the retreat. Not like I still don't have several days before I leave, but no point waiting till the night before. 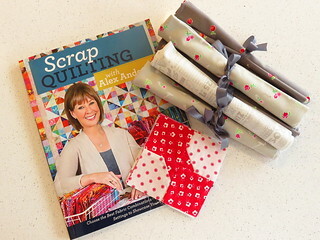 Our group has a block lotto, and this time we're making scrappy bow tie blocks from Alex's book Scrap Quilting with Alex Anderson. You can make one or more, and the more you put in, the better your chances are of winning the lot. I made four, so far anyway. 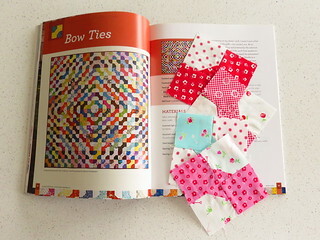 Bow ties are a favorite, and I can just go through my scrap basket and find pieces just right. We also play Left, Right Center, so I have my fabrics for that. Last year you brought three batik fat quarters, this year we're picking one color and bringing a light, medium and dark. We might play more than once, so I have enough for two games. It was pretty exciting last time, I had never played before. Yesterday was Splendid Sampler day! Amy designed a cute block she named Snug as a Bug. You can read about it on her blog, and download the pattern over at The Splendid Sampler! I can't wait to see your blocks! i love left right and center and my friendship group plays every month. We haven't tried the light, medium dark routine so I think I will suggest that next time it's my turn to call it. Hope you love your kitchen, you'll have to show us photos! Have a great week Pam.